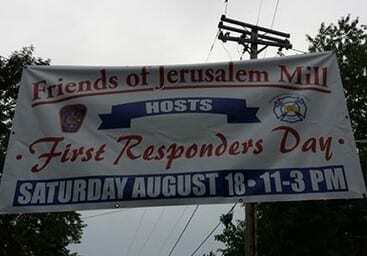 First Responders Day is set to kick off at historic Jerusalem Mill today, Saturday, August 18, 2018. The event will run from 11 a.m. to 3 p.m. at Historic Jerusalem Mill Village, located at 2800 Jerusalem Road, Kingsville, MD 21087. Joppa-Magnolia Volunteer Fire Company, Kingsville Volunteer Fire Company, Maryland State Police Aviation Unit, Harford County Sheriff’s Office, and the Department of Natural Resources’ Forestry and Maryland Park Service are hosting this family-friendly event with fire equipment of all descriptions, demonstrations, displays, K9 unit and activities for young and old. The organizers of the event will be honoring the first responders and acknowledging the selfless sacrifices of these brave men and women. The representative fire departments will plan and include a friendly contest for bragging rights, custody of a trophy, and a cash prize from the event’s sponsors. For more, visit the event on Facebook here.